Summary: Water sports and even casual swimming can be dangerous for contact wearers. Here are some reasons why. If you are new to wearing contact lenses, you might be thinking that swimming or partaking in water sports with your lenses on is okay. As a matter of fact, you could be risking a serious infection. This guide is designed to inform you of the dangers of swimming with contact lenses on. Not only do pools carry a significant amount of chlorine, but they’re a cesspool for bacteria, germs, and all types of nasty things. Whenever you are about to enter a pool, it’s important that you take off your contact lenses beforehand. Just like you would do before a shower, you need to keep your contacts away from water at all times. When exposed to the different minerals and chlorine in swimming pools, contact lenses will start to lose their effectiveness and dry up much quicker than you are used to. Now, if you are using dailies, you can easily throw them away afterwards. However, contact lenses that are designed for weeks or a month won’t be the same after you put them back on. This is because they are not designed to be drowned in chemicals or even purified water. The only type of liquid solution that these contact lenses should touch, aside from your eyes, are the recommended contact lens solutions that your eye doctor recommends. Be careful not to rinse them in the sink if they have dust or dirt on them. You could risk an infection that may require medical attention. 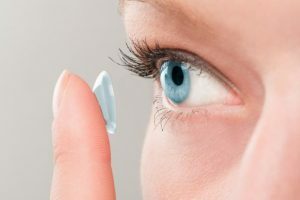 Blog submitted by Lens.com: For the most cost-effective multifocal contact lenses currently on the market, trust the experts at Lens.com for the widest selection and the lowest prices.